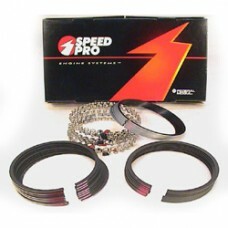 Speed-Pro High Performance Plasma-Moly file fit piston ring set. Features high-tech plasma-moly faced ductile iron top rings for nearly instant ring seating, superior cylinder sealing and optimum durability under the most gruelling conditions. The second rings have a taper-face for reliable oil control and intentionally allow an escape path for any combustion gases which get past the top ring. Any pressure trapped between the upper and second ring will unseat the top ring, and cause “flutter”, premature wear and reduced cylinder sealing at high RPM. The famous SS-50 oil ring is the best-proven design for controlling oil. Ring Size: 4.005” (File fit on STD bore). Top Ring: 5/64” Plasma-Moly. Second Ring: 5/64”. Oil Ring: 3/16” Standard Tension.